Junior 2 is a new building complex characterized by a low building profile. We are awaiting being awarded a 3-star hotel designation but in the meantime you can expect an excellent facility, and a high standard of rooms and services as well. 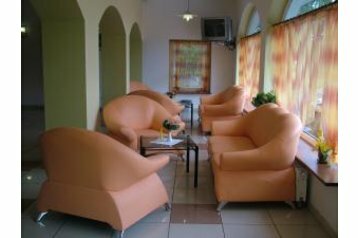 The hotel is located in the southern part of Cracow (around Mountain Borkowska, Carrefour Shopping Center Zakopianka and Łagiewniki). The exit is close to the A4 motorway, which will help you quickly connect to any destination. For travellers arriving by public transport access to the hotel will not be a problem. The bus stop is right next to us (20 meters away). In the immediate vicinity of the hotel is a Fitness Club, where you can enjoy such exercise opportunities such as a weight room and raquetball, etc. We provide our guests with a total availability of 36 rooms, which allows us to accommodate up to 120 people. These rooms accomodate 1, 2 and 3 persons, with extra beds also available. Each room has a private bathroom with shower, radio, telephone, satellite TV and free Wi-Fi. We have free parking, restaurant, drink-bar and a 24-hour reception office. Check-in starts at 14:00, and checkout is at 12:00 noon. To extend your stay the hotel, please contact our reception staff. Hostel na okraji mesta Krakov / Kraków. V hosteli / areáli sa nachádza reštaurácia, bar, Wi-Fi internetové pripojenie. Parkovisko - neplatené. Autobus 400m. Krakov - centrum 8.5km.